Sillyness wins in our house, how about yours? 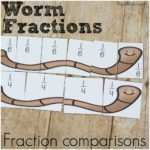 Anything silly and funny is hit and easily aids the learning process. My kids are as silly as they come and it’s a good thing, because they have very silly parents. So when we can do a silly exercise and call it school work and educational, we’re all over it. 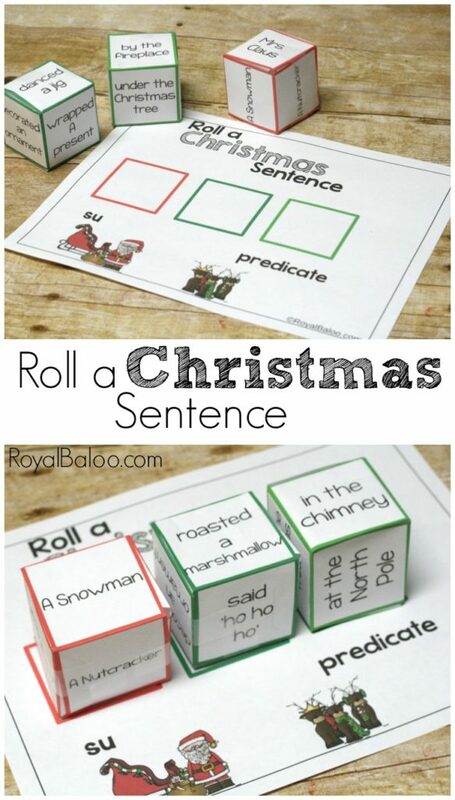 And that’s why I love the Roll a Christmas sentence game. It’s not so silly that I lose them but it’s silly enough that they just want to keep playing. Which is exactly what happened with this activity. 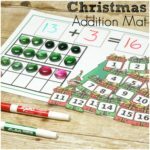 This is day 11 (I think, lost count) of my 12 Days of Christmas Printables! The best way to keep up with the freebies is by joining the e-mail list! 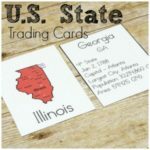 Once a week you’ll get an e-mail with a long list of freebies on a particular theme AND an exclusive freebie from me! 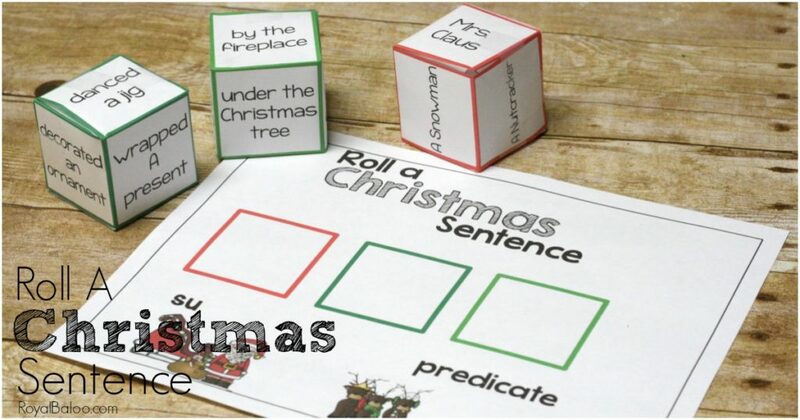 I provided two ways to make these sentences – using printable dice or using the photo window blocks. 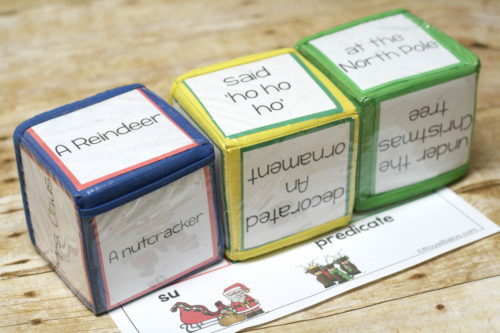 I prefer the blocks, but the paper dice are fun too. Either way, just print them on regular paper! 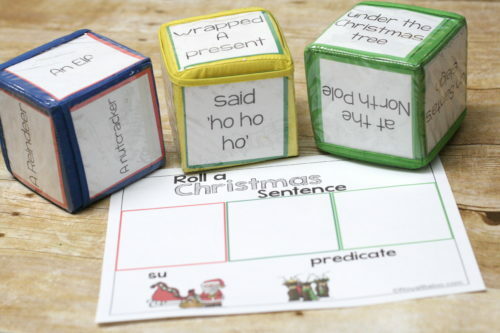 No need for cardstock for these (although the dice will last a lot longer with cardstock). I think the photo blocks are more fun to just throw around. They’re quite durable but still soft. 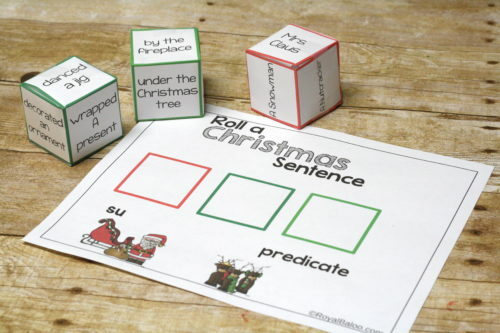 The colors on the printable dice are easier to see though and feel more “Christmas-y”. It’s a hard choice. We had both and they were both fine. We started by just rolling one each and seeing what we came up with. 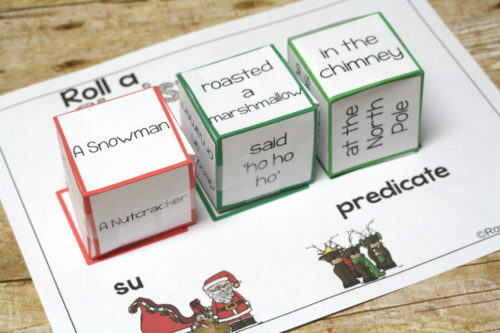 Some of them were very silly, such as “The Snowman roasted marshmallows in the chimney. My kids are pretty sure that was referring to Olaf from Frozen. 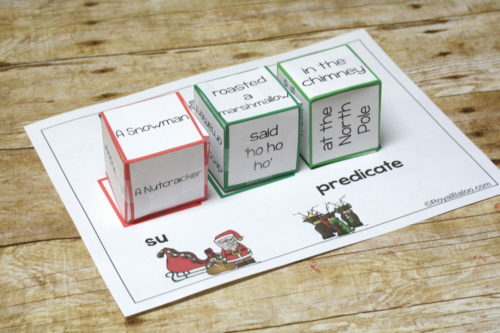 We talked briefly about nouns and verbs, subject and predicate. We also took turns finding the silliest sentence we could come up with. One person would get to choose all three dice. Finally, you can have each person pick one die and chose one side. Combine all three choices to see what random sentence you come up with! Sure to be silly! 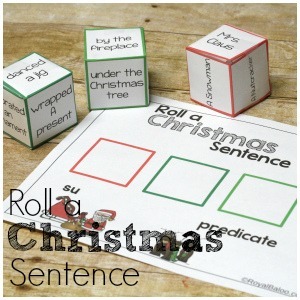 Go Here to Download the Christmas Roll a Sentence!